One of the biggest challenges facing mothers is when and how to wean their babies. In practice, a mother has only two months of maternity leave after childbirth and has to return to her normal duties in order to earn a living for her family. Therefore breastfeeding must be supplemented with solid or semi-solid food through a process called weaning— a gradual introduction of other feeds into the baby’s diet to supplement mother’s milk. Weaning should be done with a lot of care and consideration so as not to hurt the bond developed between the baby and the mother. It is cruel to suddenly stop the child from breastfeeding. It is worse to let it stay with relatives or with a house help. This could have far-reaching psychological, emotional and nutritional effects that are harmful to the child. This should, therefore, be done gradually for the baby to accustom itself. This type of weaning takes place when the mother suddenly stops breastfeeding. This can cause an emotional trauma for the baby as breastfeeding is not only a source of food but also a source of security and emotional comfort. Therefore taking it away abruptly can be very disturbing and should not be done. In the case of the mother, the breasts will respond by becoming enlarged and one may develop a breast infection or abscess. The hormone level drops abruptly and depression can result. This type of weaning is where breastfeeding is replaced with solid food and breastfeeding is done once or twice a day. The mother encourages the baby to wean by providing interesting distractions and other nourishments in place of breastfeeding. In gradual weaning, the mother limits breastfeeding to a few times and gradually replaces the other time with forms of nutrition such as porridge and fruits. When weaning is done over a period of weeks or months, the baby and the mother are unlikely to be affected. At the age of two years, the baby is ready to stop breastfeeding entirely. With this method the mother only allows the baby to breastfeed once e.g. when going to sleep or when waking up. After several weeks or months, the baby stops as he can now eat a properly balanced meal. This means allowing the baby to outgrow breastfeeding entirely on his own. Most mothers choose to wait for this type of weaning. When the mother chooses natural weaning, it is important to lovingly guide the baby through the process. The baby should not be teased, threatened or laughed at. The mother should ensure that the baby is eating well and having a balanced diet. Most babies are ready to start semi-solid foods from the age of 3-6 months. Introduction of solid/semi-solid food should not start earlier than this age as the baby might develop problems with the digestive system or develop allergic reactions too early. Baby is no longer interested in breastfeeding. Baby is able to sit with support, reaches out or grabs and tries to put hand or toy into the mouth. The baby tries to reach for the food on your plate. The baby mimic’s your eating behavior such as opening the mouth wide when you open your mouth to eat. The mother should expect mixed signals during this time as the baby is also learning to communicate. This process of introduction supplementary feeding is full of joy and pains but can be enjoyable if you watch and follow the baby’s cries. 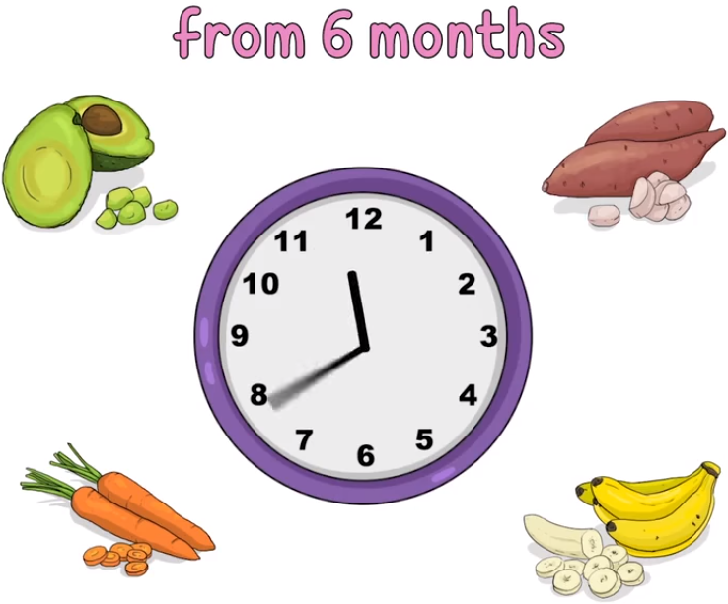 If you are introducing solid food at an early stage, say 3 months, it is advisable to start with porridge or something easily mashed, like ripe fruits.